Chief executives joined together to call out the executive order, which has temporarily banned travel from seven Muslim-majority countries. Microsoft boss Satya Nadella, who immigrated to the US from India, and Facebook’s co-founder and chief exec Mark Zuckerberg, who is the son of immigrants, pointed to how their platforms wouldn’t have been built without immigration and the flow of people and ideas from all over the world. FundersClub (FC), a funding platform for startups in the US, published a report this week on the diverse makeup of the startup founders it works with. 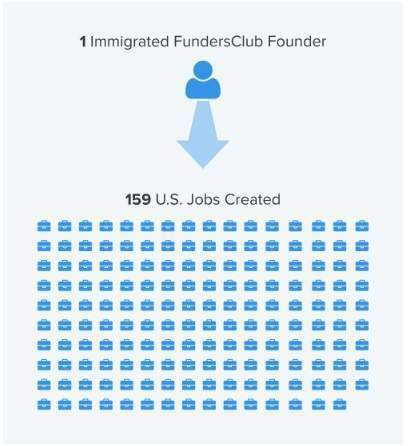 It turns out that on average immigrant startup founders create 159 new jobs – demonstrating the strength of the US’s immigration startup community. Of the 82 founders it spoke to, it was found that 39 leaders were first generation immigrants. Of this first generation group alone, from 19 different countries, the companies they have started have created an aggregate of 6,208 jobs in the US. This makes an average of 159 new jobs, per startup. When this is expanded to include second generation immigrant founders, this adds an extra 21 startups to the list. Combining the stats from these two groups, the founders have started companies that have created 7,362 jobs, creating an average of 127 new jobs each. It’s not even FC’s specific set of startups that are having an impact on the US this way. According to a study by the National Foundation for American Policy, 51 percent of startups valued at $1bn, so unicorn status, or more had at least one immigrant founder. And when valued together, those 44 unicorns are worth $168bn. FC makes the point that it has a young portfolio, with the oldest startups in its cohort just over four and a half-years-old. But this data shows that immigration is a good thing for the US – it brings fresh ideas and interesting people to the country that have given us things like: Tesla – Musk’s parents are from Canada and South Africa; Twitter – Jack Dorsey is of Italian descent; and Apple – Steve Job’s father was Syrian, one of the countries that has been included in Trump’s ban. Though Trump’s travel ban is only temporary, the backlash from it has been huge. Washington State has already launched a lawsuit against it, backed by Amazon and Microsoft, and protests took place across the world, including the UK on Monday, criticising the policy. It could be set to get worse though as reports have said the White House has suggested the ban could be extended after the 90-day period to include other countries including Pakistan.